On a summer holiday in Croatia in 2006, I went for a walk in the town of Rovinj. 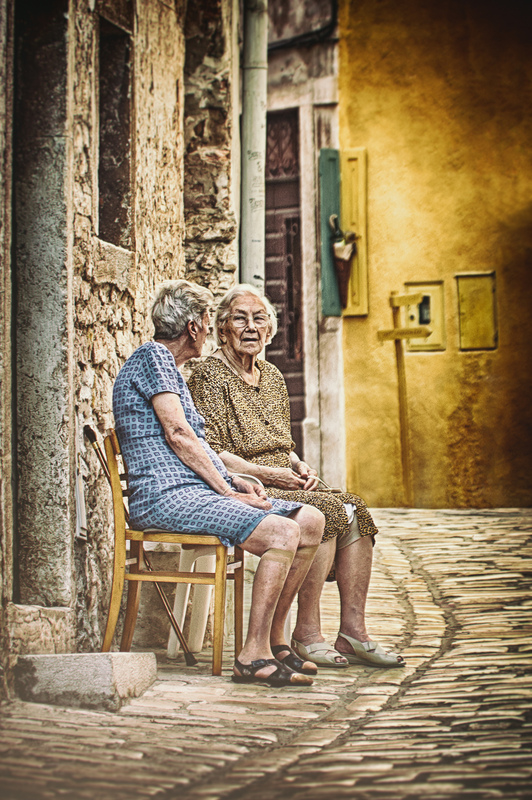 Here I passed these two amazing ladies, who where talking about all kind of things…… well I do not speak Croatian, so I can´t be sure of what they where talking about, but it looked like they where having a good time. I walked a little pas them to get a bit more of the street – which was totally empty – in the frame. Normally, I usually ask people if I can take a picture of them, but in this case I diden’t cause it wouldn’t stop them in their talk, which often happens when you ask for permission, people stop what they are doing and it becomes a completely different photo. The photo was given the royal treatment in photoshop, I added a large vignette with blur and dark corners around the two ladies, the image was desaturated and I added a yellow/brown tone. Small Talk by Bo47 is licensed under a Creative Commons Attribution-NonCommercial-NoDerivatives 4.0 International License.